Explanation: In myth, Atlas holds up the heavens. But in this moonlit mountainscape, peaks of the Himalayan Annapurna Range appear to prop up the sky as seen from Ghandruk, Nepal. From left to right the three main peaks are Annapurna South (7,219 meters), Hiunchuli (6,441 metes), and Machapuchare (6,995 meters). Of course the mountains are moving not the stars, the Earth's rotation about its axis causing the concentric star trails recorded in the time exposure. 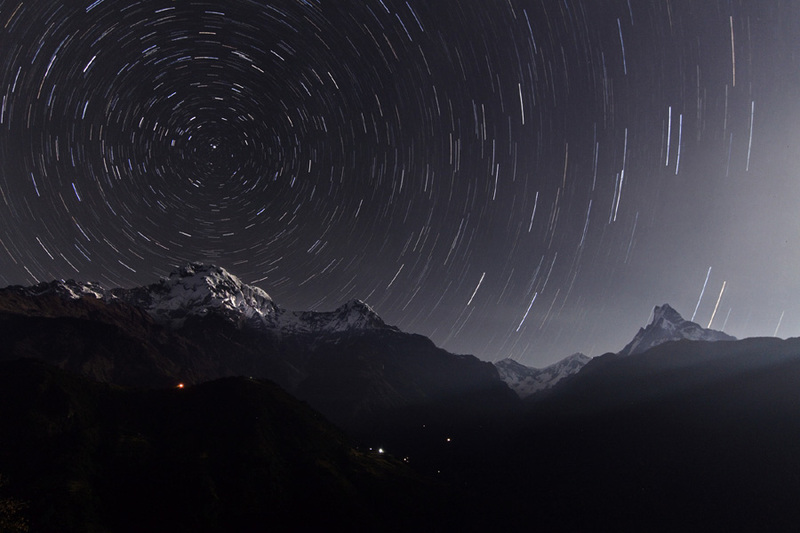 Positioned above Annapurna South, the North Celestial Pole is easily identified as the point at the center of all the star trail arcs. The star Polaris, also known as the North Star, made the very short and bright arc closest to the North Celestial Pole.